What: Businessman and former United States Secretary of Housing and Urban Development Henry Cisneros will speak to California State University, Northridge students, faculty, alumni and the community about the evolving demographics of America’s cities and the roles small business and business leadership play in urban economic development. 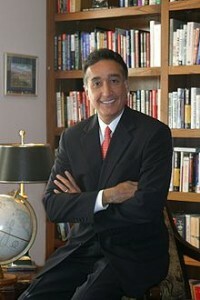 Cisneros served as Secretary of Housing and Urban Development during the first term of former President Bill Clinton’s administration. Prior to his time on Capitol Hill, he was mayor of San Antonio, Texas, his hometown, for eight years. After leaving public office, he served as president and COO of Spanish-language TV network Univision before founding CityView, an investment management and development firm that works with complex multifamily housing projects in urban areas of the western U.S.
His lecture, titled “Los Angeles and America’s Cities: The Economic Engine of the Nation’s Future,” is free and open to the public. The event is hosted by CSUN’s David Nazarian College of Business and Economics. Media Contact: Andrew Escobar, CSUN Media Relations, (818) 677-2130 or andrew.escobar.374@my.csun.edu, or Carmen Ramos Chandler, CSUN Media Relations, (818) 677-2130 or carmen.chandler@csun.edu.